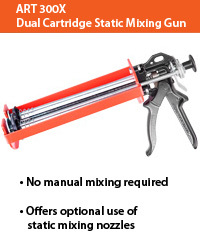 Static Mixing Nozzles CAN NOT be used with this gun. It is not engineered to withstand the extra force required to push the epoxy through the nozzles. through the tip. No manual mixing required! This kit offers the convenience of the smaller 150ml tube with the capability to use ART’s static mixing nozzles. 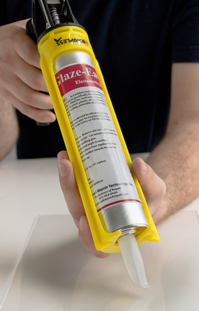 When used with static mixing nozzles, the two-part epoxy is mixed as it is pushed through the nozzle. No manual mixing required! 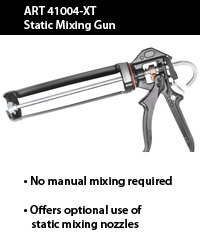 DO NOT USE Static Mixing Nozzles with this gun. The ART 300 LV Dual Cartridge Dispensing Gun is not engineered to withstand the extra force required to push the epoxy through the nozzles. For your smaller volume epoxy repairs – Use with 150ml cartridge which has two internal chambers to separate the two-part epoxy. No thumb release, no buttons to push, no special way to click the handle. It’s simple and automatic. 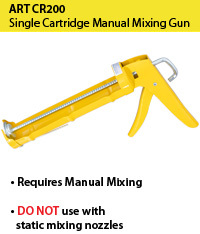 DO NOT USE Static Mixing Nozzles with this gun. The ART CR200 Single Cartridge Dispensing Gun is not engineered to withstand the extra force required to push the epoxy through the nozzles. 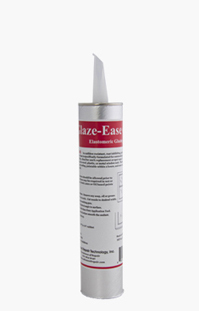 of the smaller 150ml tube with the capability to use ART’s static mixing nozzles. Note: the 150ml cartridge has two internal chambers which separate the two-part epoxy. Fits into an ART Dual Cartridge Dispensing Gun (Item # ART 300LV). Fits into a standard caulking gun. Does NOT include caulking gun. Specifically designed to repair full cellular PVC, trim boards or Azek. 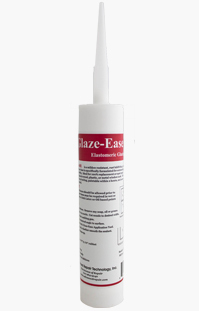 Designed to be used with Flex-Tec HV Elastomeric Repair Compound. 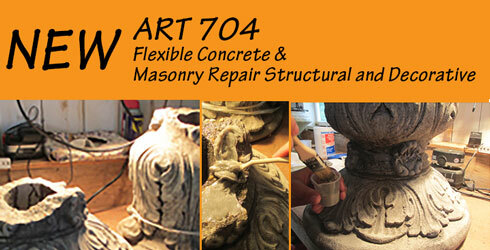 Designed to be used with Flex-Tec 704 HV Concrete Repair Compound. Designed for large area repairs such as window sills, columns, and more. 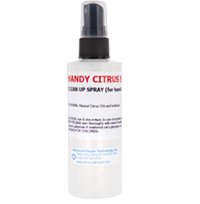 Use to clean tools or hands when working with uncured epoxy. Can be used for general purpose clean-up as well. Pkg. 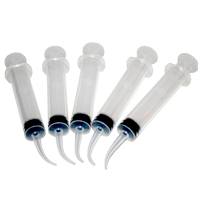 of 5 disposable Plastic Syringes which can be filled with tinted epoxy for fine detail work. Pkg. of 5 disposable graduated Measuring Beakers which can be used to accurately measure ART 901 Prime-a-trate Bonding Agent. ART 901 Prime-a-trate Bonding Agent in right where you need it. 300 ml/10.1 oz. Caulking Tube. One wide angel knife included. This unique compound is designed for easy tooling, paintable within 24 hours and cures to a durable resilient compound. 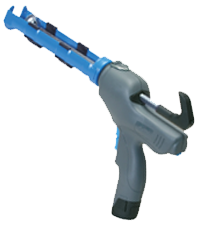 Rugged composite construction engineered ergonomic grip, reduces stress in the hand and arm, rotating barrel, sharp precision cutter, and extra long clean-out. User to determine which size Easy‑Stop will work with your windows. Easy-stop incorporates patented technology within an engineered parting stop to effectively decrease air infiltration while leaving the original details of the window untouched. for the bottom of the window sash. Used to cut channel to receive barbed pile on the meeting rail and the silicon flap on the lower sash. 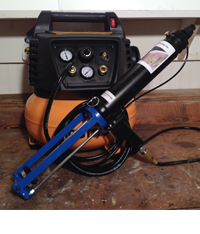 This HV gun has mechanical advantage to use static mixing nozzles. 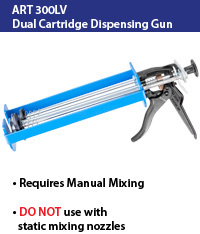 Note: Static mixing nozzles CAN be used with this dispensing gun.